The new Halloween Fireworks Dessert Party viewing for Mickey’s Not So Scary Halloween Party will bring back a popular feature from the past and offer a new Halloween Party fireworks show. NOTE: Parade viewing has not been confirmed. Some Disney sources said yes, others have said no. Guests will be provided with an exclusive viewing area for the parade at the flagpole area for the first parade, then be escorted to the Tomorrowland Terrace Dessert Party area to indulge on Not So Scary treats before watching the new Halloween Fireworks show from an exclusive, seated viewing area. 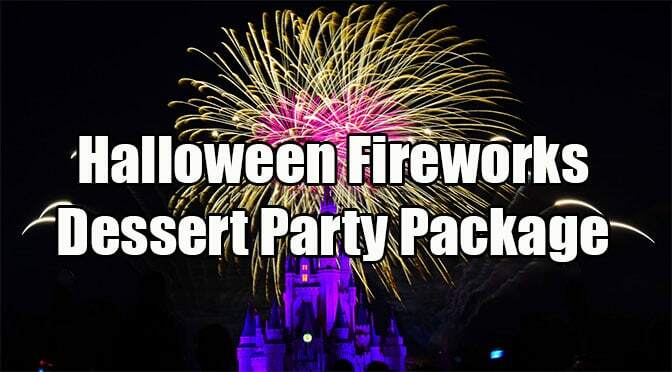 The Halloween Fireworks Dessert Party costs $84 per adult and $50 per child 3 to 9 years of age. The price does not include tax. Book online or by calling (407) WDW-DINE or (407) 939-3463. Tickets to Mickey’s Not-So-Scary Halloween Party are required and not included in this event. MouseClassTravel clients can contact Lisa via email and she will be happy to take care of this purchase for you! What do you think about this improved offering? The Disney website doesn’t mention parade view included. Can you confirm? I had just said I didn’t want to do another dessert party because of being squashed in and standing anyway. It appears Disney was listening after all. I enjoy the flagpole viewing for parades. And then a seated area for fireworks – yay! Kenny, what’s your source? As mentioned above, I just got a string of denials from guest services. Do you think the seated area will be Tomorrowland Terrace or something new? I have called WDW Guest Services about whether parade viewing is included, and spoken with 3 attendants, 2 of whom seemed kind of clueless and to be reading off scripts; these 2 flatly denied the inclusion of any parade viewing. The remaining attendant said she’d heard something about this but could not confirm, and sent me to someone else who denied parade viewing. I don’t see anything on the WDW site that it’s offering parade viewing this year? That’s information I was provided. Is the parade viewing included for both the Plaza Garden View and the Tomorrowland Terrace view? The start time for the Tomorrowland Terrace party, according to the Disney website, is the same time as the first parade was last year.